Must See! 1900's Victorian Replica.designed to make Nearly New Home a Turn of the Century Epic Estate.Apt Over Garage. Full pics 6/1 Gate Opens Into Park From Side Yard. Every attn to detail, leaded glass windows,heart of pine flooring throughout. 3 complete suites upstairs.1 lux. suite on main. Interior Features Heart of Pine Custom Flooring through out main. Every bedroom is a suite. Eight ft doors solid stained wood. Master has 2 seating areas and screened sleeping porch. 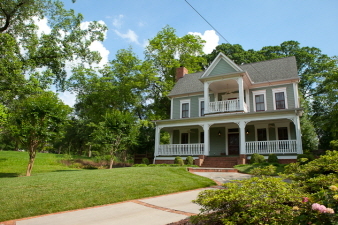 Family room, Kitchen and keeping room all open, and open onto screen porch overlooking park. Full Guest suite on Main and Basement for additional Recreation areas. Apartment over garage could be a full studio. Exterior Features Fabulous Rocking Chair front Porch and fully terraced backyard with built in Fireplace and picturesque views of park. 2 Car garage and additional parking. Carriage house over garage, is 5th bed and bath. Additional Features and Amenities Walk to Restaurants, Bars and Shops in Inman Park. Easy access to MARTA.